Since I can’t actually go to the store with you, I will walk with you up and down the aisles of your supermarket and help explain confusing statements and deceptive labels on some of the products you’ve been purchasing for years. Moreover, I’ll enable you to become skilled at separating fact from fiction by uncovering some of the most popular food myths that are highlighted by media hype, geared toward selling sound bites instead of sound advice. 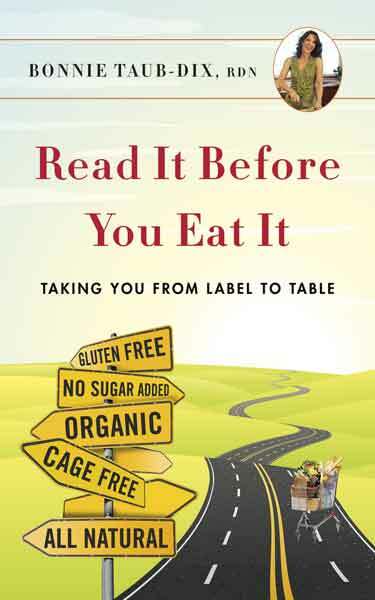 So, this is what makes my book stand out from the rest: unlike food activists that just tell you what to do because they say so, Read It Before You Eat It will give you the opportunity to shop with me, a registered dietitian nutritionist who will take your individual needs into consideration. This book is meant to help you determine the best foods to buy by enlisting the aid of a powerful weapon that can help you succeed in meeting your personal needs while cutting through the confusion— and that’s the food label. The label has been there for years, right in front of you, but you may have ignored it. I understand. And believe me, you’re not alone. Labels can be misleading, full of terms you don’t know. You might think that since labels are carefully regulated there would be no room for misinterpretation about what goes on the package . . . right? Wrong. Labels are not just about government regulations and definitions, they are about educating and enticing consumers. But there are certain circumstances where the facts get twisted and additional interpretation is necessary.